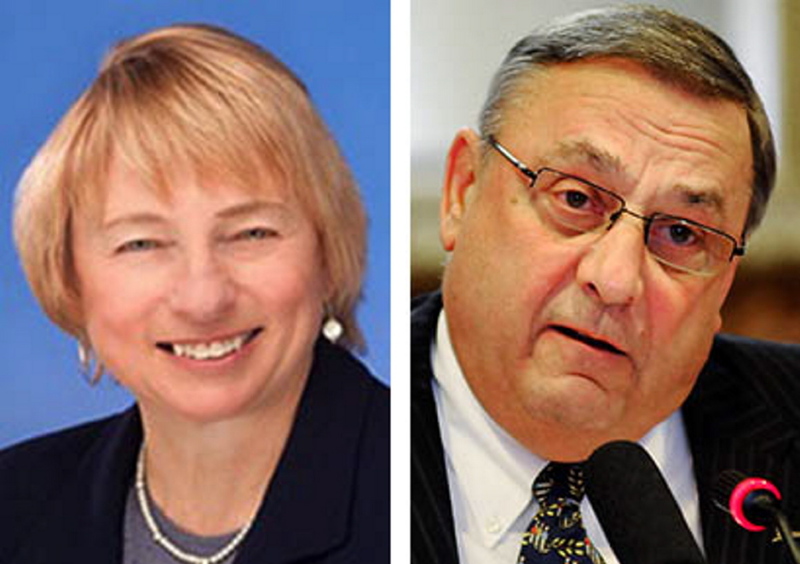 The governor tweeted Tuesday that Janet Mills 'speaks for herself' in opposing Trump's temporary ban. Gov. Paul LePage said Tuesday that he supports President Trump’s immigration order to temporarily ban immigrants from seven mostly Muslim countries and suspend the refugee resettlement program. LePage, who has raised concerns about refugees and asylum seekers in Maine, weighed in on the national immigration debate via Twitter a day after Democratic Attorney General Janet Mills signed onto a legal brief opposing Trump’s immigration order. “AG Mills speaks for herself on immigration order. I fully support @realDonaldTrump exec action to protect all Americans,” LePage tweeted shortly before 2 p.m.
Trump’s executive order Jan. 27 suspended refugee resettlement for 120 days and temporarily banned entry of immigrants from Iraq, Syria, Iran, Sudan, Libya, Somalia and Yemen. In response, protesters filled airports throughout the U.S. to push back against Trump, including a crowd of 2,000 people at the Portland International Jetport on Jan. 29. Days later, a rally organized by a sophomore at the University of Southern Maine drew a crowd of about 1,500 to the plaza in front of Portland City Hall to show support for Muslims and immigrants in Maine. A federal court last Friday halted implementation of the order, saying it was too broadly worded. The 9th U.S. Circuit Court of Appeals is expected to take up the administration’s appeal later Wednesday. The wording of the order and the subsequent legal wrangling has created fear and uncertainty for many immigrants and advocates. On Monday, Mills became the 17th state attorney general to sign onto a legal brief asking the appeals court to uphold the lower court’s decision to block the order. Also, 97 technology companies, including Apple, Facebook, Google and Microsoft, also signed a legal brief in opposition. It’s not surprising that LePage would break with the Mills. The Republican governor and Democratic attorney general have clashed in the past over a variety of issues, including immigration. LePage, for example, has long sought to prohibit some asylum seeking immigrants from getting state welfare benefits. But Mills blocked one such attempt in 2014, ruling it was unconstitutional. LePage most recently complained about immigrants seeking asylum when he appeared Monday before the Legislature’s Appropriations and Financial Affairs Committee. He was asked about the fact that many of Maine’s new immigrants are well-educated professionals with families – exactly the people he claims to want to attract to Maine. “Immigrants and refugees, both primary and secondary, I think they are very, very important for the future of the state of Maine,” he said. But he said the same is not true for immigrants who come and seek political asylum. The vast majority of asylum seekers in Maine arrive legally with temporary visas and then seek asylum to stay permanently. Asylum seekers are often highly educated and skilled but are not allowed to work for at least six months, and many rely on General Assistance vouchers paid for by their host community and partly paid for by the state. “The problem with asylum seekers is this: They come to your neighborhood, they apply for benefits, they get an all-expense-paid, two-year vacation because they can’t work. They are going to be dependent,” the governor said on Monday. Last November, LePage sent a largely symbolic letter to Pres. Obama on Nov. 4, saying that Maine would no longer participate in the refugee resettlement program. The move had little effect, since immigration is the purview of the federal government. Last year, LePage linked immigrants to the spread of diseases, even though the administration could not back-up that claim with any data.